I will begin by stating the absolute obvious, which is that this cover is one of the most beautiful covers I've ever seen in my life. Bra-freaking-vo to the illustrator that made that magic flow through their fingertips. This book surprised me. The subject matter is especially pertinent in our current socio-political climate. It centers around Jade, who becomes embroiled in political conflict after she finds the corpse of a naiad in the arms of her betrothed. Jade does the right thing and reports the murder to the police, which throws her life into chaos as the upper echelons of mer society view her as a traitor and political tensions between the mers and the naiads rise. One thing I want to highlight that I greatly enjoyed was the worldbuilding. Not just of Thessalonike itself, but of the full underwater experience. The way they dressed, the way they ate, even the way they spoke. It felt truly immersive, not like someone took regular earth culture and stuck it underwater. 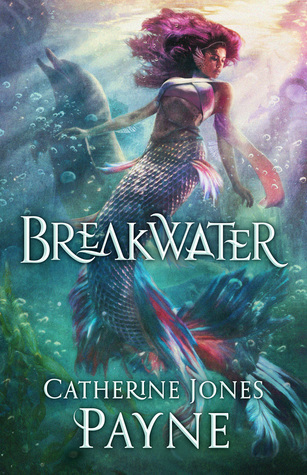 Catherine Jones Payne did a great job of creating the world and the unique behaviors of an underwater society. When the story first began, Jade was your typical rich daughter of a noble. She wasn't stuck up or snooty, but she was happy to play the part and get engaged to another high ranking noble. As a character, she had a definable arc throughout the story in that we see her evolve from that, to someone who is aware of the glaring inequality that exists between the mer and the naiad and does what she can to help the divide. In prosecuting Tor (her former fiance), Jade sets a precedent that naiads are not second class citizens and deserve the same justice that a mermaid would. The story does revolve heavily around that plot point, however. I'd call this a plot-driven story, rather an a character-driven story. What I mean by that is we never get to see any of the characters in a context other than how they're reacting to the scandal. Most stories have moments where they'll remove the characters from the plot for a few scenes so we as the reader can get a more fleshed out idea of them. We get to see brief flashbacks or conversations about the past, but we never really get the richness of character that I usually like to see. If I had one critique of this book, it would be that I wanted more character development. While Jade did get a full emotional arc, none of the other characters saw any growth. Overall, this story turned out to be very different from what I expected. Perhaps it's just genre bias, but I expected romance, of which there wasn't much. Instead, this turned out to be a novel about politics and racial inequality--which is cooler! Breakwater is available for purchase for Kindle, and as a paperback. Catherine Jones Payne is a Seattle native who loves the written word, international travel, crashing waves, and good coffee. Her earliest memory involves pulling up a rolling chair to her parents’ old DOS computer—while wearing a tiara, naturally—and tapping out a story of kidnapped princesses. By day she’s the managing editor of Quill Pen Editorial and the editor of Splickety Magazine. She lives in Waco, TX with her historian husband and their cats, Mildred and Minerva.